Wizardry manufactures custom industrial control panels. These pictures show panels built for one long-term customer who manufactures ~$1 billion worth of fiberglass-thread per year, using machines controlled by Wizardry's control computers. This shows 1/4 of the panels installed in Kunshan, China (near Shangai). 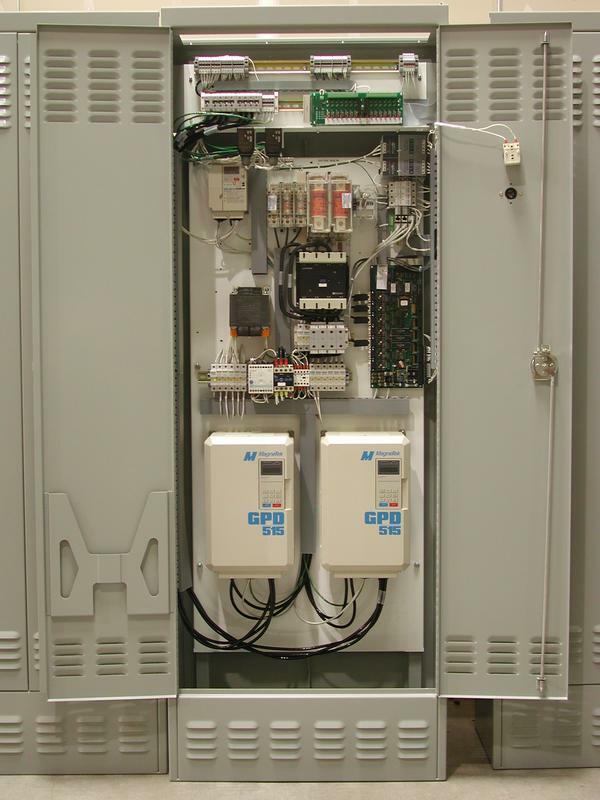 Two 20/25 Hp variable-frequency AC motor drives. 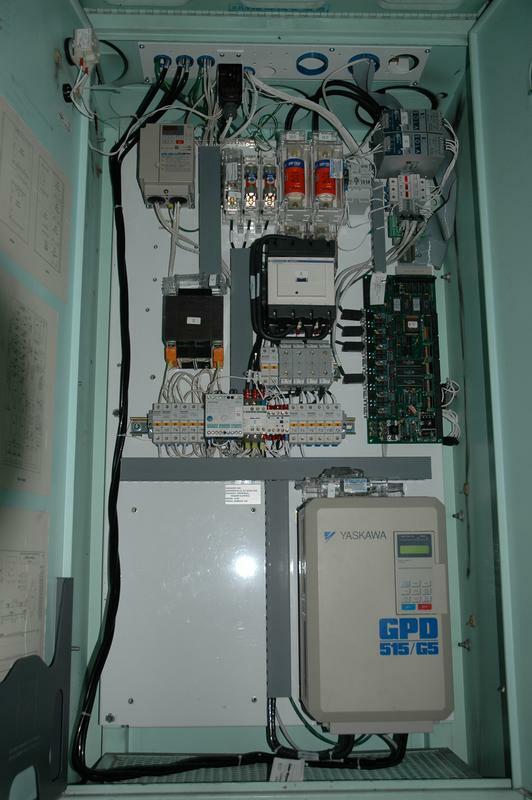 One 2 Hp variable-frequency AC motor drive. Associated circuit breakers & disconnects. Wizardry's PCC (Process Control Computer). Terminal-block area (at top) for all customer connections. Custom enclosures meet the customer's special footprint requirements. Sometimes it is more cost-effective to provide a backplate-upgrade which installs in the existing enclosure. 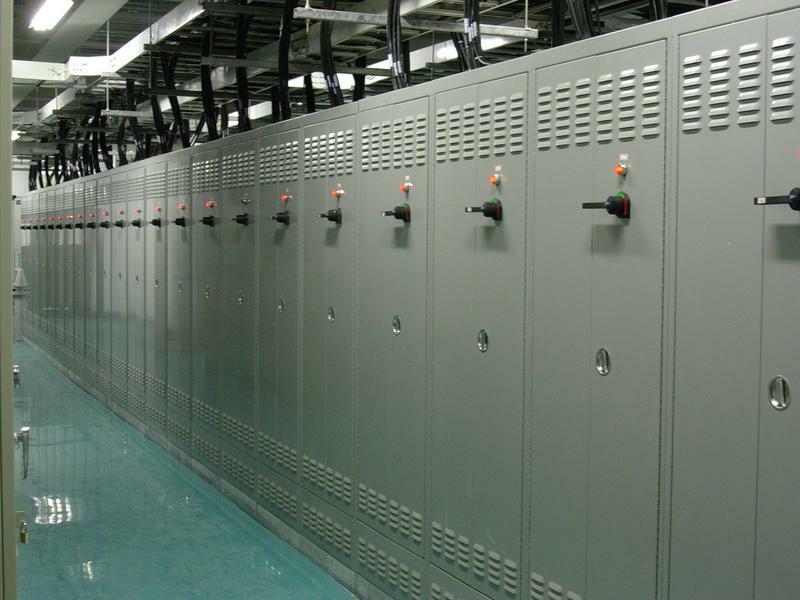 This saves the cost of removing old enclosures, building & installing new enclosures, and (with careful planning) allows the renewed unit to be directly reconnected to the existing wiring. 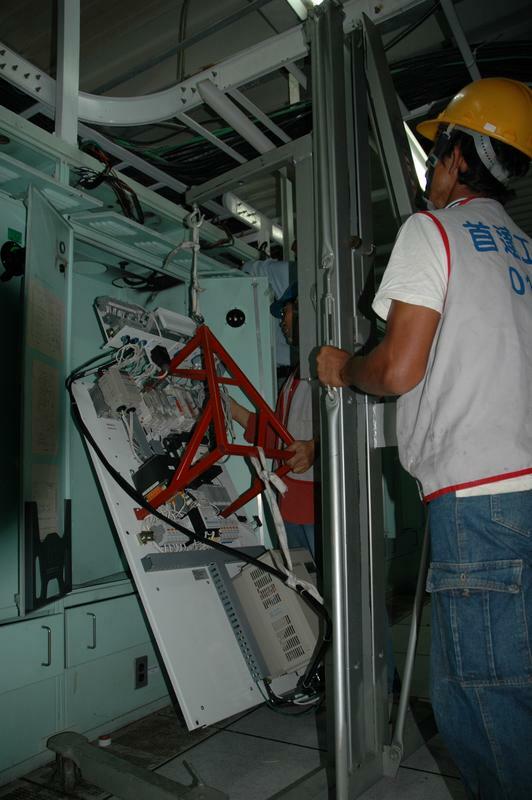 Our backplate-panels are manufactured & fully tested using an automated tester (which includes AC-drive load-testing), then shipped in a fully-tested condition (no disassembly/reassembly required). This is an efficient way to upgrade an old unit to new control-processor technology, new AC-drive technology, and new fuses/contactors/wiring. This installation is in ChiaYi, Taiwan. using a removable red pick-up structure (provided by Wizardry). This crew completed 27 backplate-upgrades in 2.5 days, including wiring. Here the unit is completely installed & wired. All these panels are powered by Wizardry's shared-DC-bus power-supply.